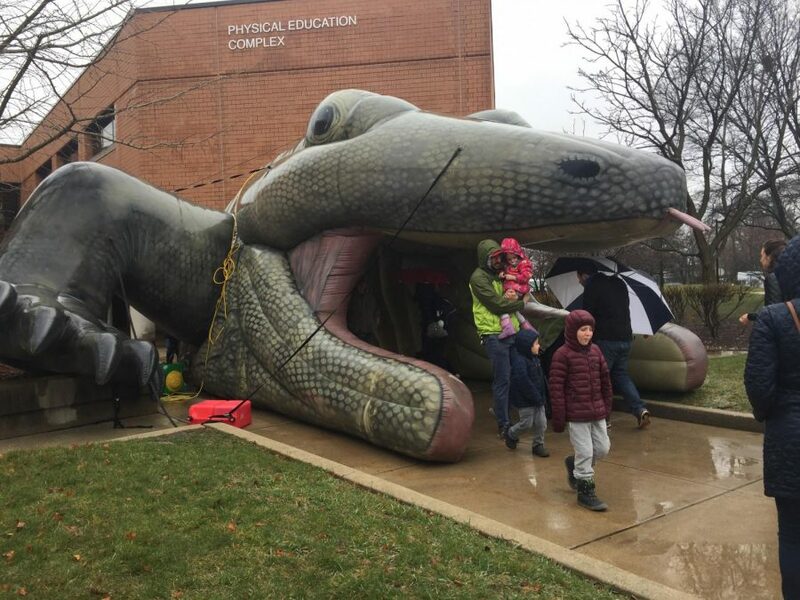 The Chicago Herpetological Society organized ReptileFest in the PE Complex on April 14 and 15, where hundreds of reptiles were displayed in glass tanks and guests were allowed to handle large pythons to baby alligators. The Herpetological Society raises awareness about reptile care and safety and holds regular adoption events, while promoting conservation of local wildlife such as garter snakes and native turtles. The Forest Preserve District of DuPage County and Lake County Forest Preserves were also in attendance, spreading awareness about the state-endangered species native to Illinois called the Blanding’s turtle. The Blanding’s turtle has a yellow chin, helmet-shaped shell with yellow spots and mostly lives in shallow lakes. A Blanding’s turtle can lay a dozen or more eggs each year and live to be 70 to 80 years old. The loss of one female turtle can mean 500 fewer eggs for the overall population, according to Burns. “For species like the Blanding’s that are already at critically low numbers it can be a statistically significant blow,” Burns said. While turtles have been inhabiting the earth for close to 100 million years, within the past century, cars have been the cause for most of their deaths. “Every year we capture adult female Blanding’s turtles in DuPage forest preserves, which they take to the Urban Stream Research Center or Willowbrook Wildlife Center. The females are induced into labor, and the eggs are collected and incubated in nurseries,” Burns said. “Each female is numbered and identified to provide a record of each mother and baby turtles that are entered into a database containing their genetic history. When the female is done laying eggs and ready to be released back into her natural habitat, she is fitted with a radio transmitter on her upper shell, or carapace, to make it easier to locate her next year. “After the eggs hatch, turtle hatchlings are numbered and given a medical checkup to determine their weight and length and overall health. We keep them for about a year, microchip them and then release them into the wild,” Burns concluded. Burns expressed that the organization’s success in capturing and microchipping the turtles have helped their growth immensely. The turtle population has been increasing over the past 22 years, and Burns is excited the progress. Brookfield Zoo and the Shedd Aquarium are also partners and supporters of the cause.